In 1851, fifteen wealthy New Yorkers wanted to show a group of Philadelphia friends just how impressive a meal could be and took them to Delmonico’s, New York’s finest restaurant. They asked Lorenzo Delmonico to “astonish our Quaker City friends with the sumptuousness of our feast,” and assured him that money was no object, as the honor of New York was at stake. They were treated to a magnificent banquet, enjoyed by all. However, not to be outdone, the Philadelphia men invited the New Yorkers to a meal prepared by James W. Parkinson in their city. In what became known as the “Thousand Dollar Dinner,” Parkinson successfully rose to the challenge, creating a seventeen-course extravaganza featuring fresh salmon, baked rockfish, braised pigeon, turtle steaks, spring lamb, out-of-season fruits and vegetables, and desserts, all paired with rare wines and liquors. Midway through the twelve-hour meal, the New Yorkers declared Philadelphia the winner of their competition, and at several times stood in ovation to acknowledge the chef ’s mastery. 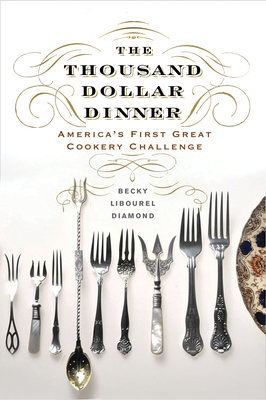 In The Thousand Dollar Dinner: America’s First Great Cookery Challenge, research historian Becky Libourel Diamond presents the entire seventeen-course meal, course by course, explaining each dish and its history. A gastronomic turning point, Parkinson’s luxurious meal helped launch the era of grand banquets of the gilded age and established a new level of American culinary arts to rival those of Europe. BECKY LIBOUREL DIAMOND is a journalist and research historian who specializes in reconstructing eighteenth- and nineteenth-century American recipes. She is the author of Mrs. Goodfellow: The Story of America’s First Cooking School, also available from Westholme Publishing.